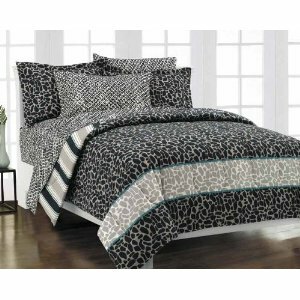 Tame your wild side with this fashionably neutral Animal Print Savannah mini complete bedroom ensemble, in cool hues of charcoal, dove gray, black and white. The face of the comforter and the standard flanged pillow sham features an allover animal skin pattern in black on charcoal; the comforter is punctuated by a wide horizontal band of the animal skin pattern in dove gray on white set off by narrow teal stripes. The reverse of the comforter features a graduated vertical stripe in black, white and dove gray, accented by a teal pencil stripe. The 180-thread-count sheets and pillowcases feature small animal skin spots in black, charcoal and dove gray, arranged in a basket-weave layout on a white ground. All components are constructed of a cotton-rich blend of 60% cotton and 40% polyester and are machine washable. The Savannah mini complete bedroom ensemble retails for $89.99 in better specialty chains and upscale department stores!